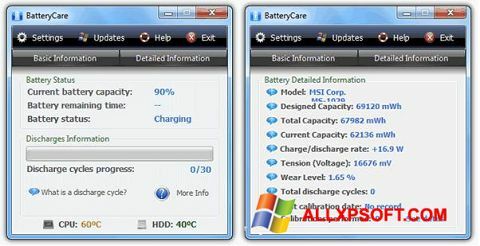 BatteryCare for Windows XP - a useful software that allows you to analyze the discharge-charge cycles of the battery. It gives you the opportunity to increase the speed of work, improve the performance of the software. The utility prolongs the time of autonomous use of components, supports a huge number of models of netbooks, laptops with a known operating system. It provides a full report on the battery usage of the device, displays important system parameters. The product will help to automatically switch power plans, statistically calculates the time to full discharge. You can free download BatteryCare official latest version for Windows XP in English.